Although blisters can appear all over the body, they’re particularly common on feet. Your toes and heels, as well as the tops, soles and sides of your feet, can all be affected. Your feet are likely to feel sore and your mobility may be reduced until the blisters have healed. But blistered feet aren’t just uncomfortable – they can also put you at risk of serious health problems. 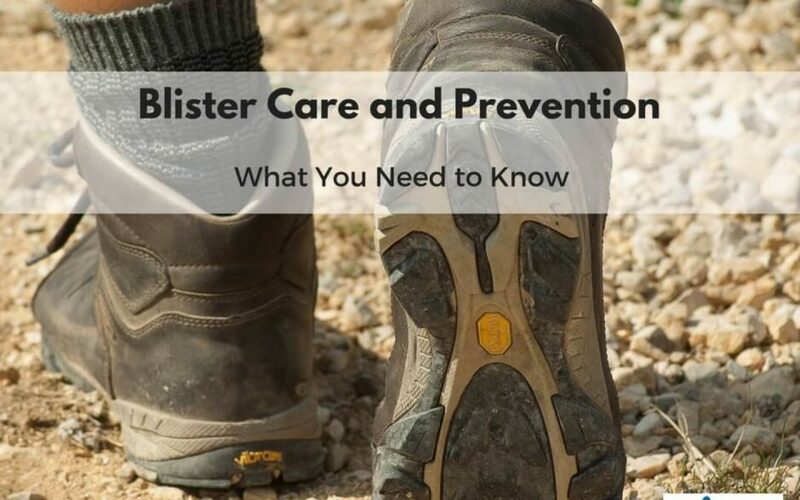 That’s why knowing how to care for and avoid blisters is so important. What is a blister? Essentially, it’s a bubble-like pocket of fluid on the skin. Developing a blister on your foot is normally a sign that your socks, tights or shoes are chafing your skin when you move, leading to excessive friction. Clear fluid is secreted between the damaged upper layer of skin and the lower layers to form a protective ‘cushion’. As the blister heals, the body absorbs the fluid. Anyone can suffer from blistered feet, but hikers, runners and people who walk long distances when working are among those most at risk. If you have diabetes-related nerve damage, foot blisters can be particularly problematic. The loss of sensation means that you might not notice them or any complications that arise until the problem becomes deep-rooted, so a sensible approach is to inspect your feet daily. If new footwear or restrictive hosiery, for example, has given you a blister, keep the following advice in mind to help you avoid any issues. Do wash your hands before touching the affected area so that it remains clean. Don’t remove any skin from a blister, even if it looks unsightly. That skin might seem redundant, but in fact it’s helping the damaged area to heal. Do cover the blister with a plaster or dressing to protect it. A hydrocolloid dressing (i.e. one that produces a protective layer of gel when in contact with fluid) is ideal. It reduces discomfort, promotes healing and helps to stop sweat or water aggravating the blister. Don’t pop the blister or else harmful bacteria may enter your foot. If it bursts of its own accord, let the fluid drain off, apply antiseptic ointment and re-cover with a new dressing. Most blisters heal within a week when properly looked after, but look out for any of the following warning signs. They indicate that professional help is urgently required. Pus – if the blister is filled with this yellowish liquid, it’s infected. Redness or unusual warmth – another sign of infection is skin that looks or feels hot. Open sores – in severe cases, blistered feet can become painfully ulcerated. Wear new shoes at home for short periods, ideally with comfortable socks, to break them in. They’ll be less likely to rub your feet when you eventually venture outside. Discard badly fitting and worn-out shoes, as well as those with thin soles. They don’t cushion and support your feet properly. Avoid shoes such as stilettoes that force your feet into uncomfortable positions – they interfere with the natural distribution of pressure across the soles. Wear moisture-wicking socks, as damp skin is more prone to blisters. The College of Podiatry suggests wearing socks inside out to stop the seams chafing your feet. Apply anti-chafing gel to your feet to fight off friction. It’s more effective than talcum powder, which absorbs sweat and so actually increases friction levels. If you’re concerned about blistered feet, rest assured that expert care is available at our London chiropody clinics. We also offer diabetic foot assessments, helping to prevent problems such as blisters becoming major issues. For professional treatment for blistered feet, please call Feet By Pody today on 0207 099 6657 or book an appointment online.